The plan to continue the canal as planned from Johnson's Hillock to Parbold was abandoned through lack of money. An arrangement was made to use the section of the Lancaster Canal between Johnson's Hillock and Wigan, and to incorporate that and the Wigan "branch" into the main line of the canal. It was not until 1816 that the through route opened between Liverpool and Leeds. In 1818 the new branch was opened between Wigan and Bridgewater Canal at Leigh, linking with the rest of the canal system. 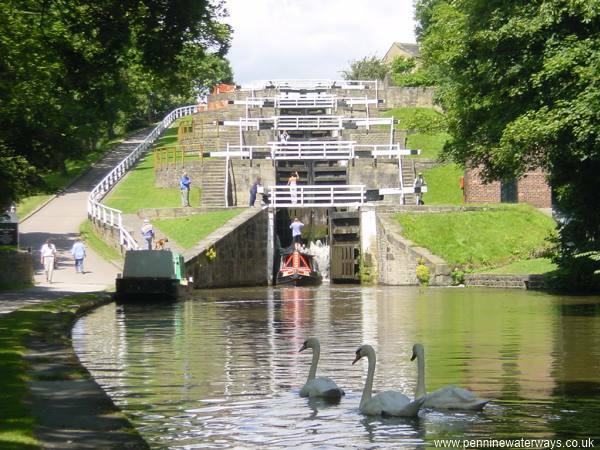 In 1864 the Leeds and Liverpool Canal took over the southern section of the Lancaster Canal between Johnson's Hillock and Wigan Locks. The canal prospered through the nineteenth century and was used for carrying stone, coal and many other goods. The impact of the railway age was not as great as with other canals but the coming of the lorry finally saw commercial traffic on the Leeds and Liverpool dwindling. The Bradford Canal closed in 1922 but commercial traffic continued along the main canal until 1964. Regular work stopped in 1972 when the movement of coal to Wigan Power Station ceased. Through the later part of the twentieth century, the leisure potential of the canal began to be appreciated and boatyards, marinas and boat hire companies have developed along the canal which is now very popular with boaters, partly for its stunning scenery and partly for the long lock-free sections that are ideal for cruising.